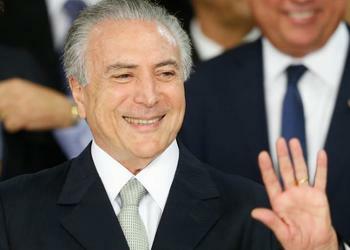 BRASILIA, Brazil, September 12, 2016 (ENS) – Brazil’s new president, Michel Temer, today ratified his country’s adoption of the Paris Climate Agreement, which sets greenhouse gas emissions targets to stop the global temperature from rising beyond 2°C above pre-industrial levels by 2100. The agreement allows each country to set its own emissions targets. Brazil’s goal is to reduce its greenhouse gas emissions by 37 percent compared to 2005 levels by 2025, and 43 percent by 2030. Agreed by the 197 countries that are members of the United Nations Framework Convention on Climate Change, UNFCCC, the pact was approved by the Brazilian Congress in August. 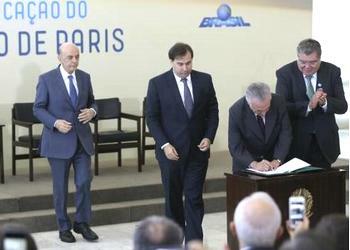 Brazil’s ratification document will be presented to the United Nations later this month. After ratifying the agreement, President Temer pointed out that Brazil has “contributed greatly to the issue of the environment” on an international level over time, including acting as host for the UN’s Earth Summit in Rio in 1992 and the Rio+20 conference in 2012. Temer told the state news agency Agencia Brasil that the climate issue is not a matter of individual governments, but a “state policy” dictated by popular sovereignty and the Constitution. In order to enter into force, the Paris Climate Agreement must be signed by at least 55 countries responsible for 55 percent of the world’s greenhouse gas emissions. To date, 27 countries, responsible for 39.8 percent of global emissions, have formally joined the agreement, including the world’s top two emitters – China and the United States. According to Environment Minister José Sarney Filho, Brazil has already begun to adopt measures established by the agreement. He said the ministry will shortly announce its “commitment to strategy,” particularly aiming to consolidate conservation and full protection areas and define sustainable use. “A new development project for clean economy will generate skilled jobs and disseminate a culture of respect for the environment. The price paid for doing nothing related to climate change would be too high for everyone,” said the minister, who expressed interest in expanding protected areas and monitoring real-time actions against deforestation. In the agricultural sector, Brazil’s goal is to reforest an area of 12 million hectares (46,332 square miles). In addition, Brazil plans to restore a vast area of degraded lands and increase by five million hectares (19,305 square miles) the country’s integrated crop-livestock systems and forestry. Brazil’s Foreign Relations Minister José Serra says that Brazil’s adherence to the agreement may bring investments to the country. “In the world, we do not lack savings. We lack investment. This agreement creates a lot of opportunities for investment. We can make a fortune if we are competent,” he said. “One way we can advance is by using cleaner transport. We have real potential for an industrial revolution that is less fossil fuel-intensive. And Brazil has the opportunity to lead this revolution,” Serra said. The energy sector is expected to increase the use of sustainable biofuels to 18 percent. Brazil plans to reach 45 percent renewable sources in its energy mix, out of which 28-33 percent are non-water sources, such as wind and solar power.